Ellis Harrison’s second goal in as many games provided Rovers with all three points on offer at Stadium MK. 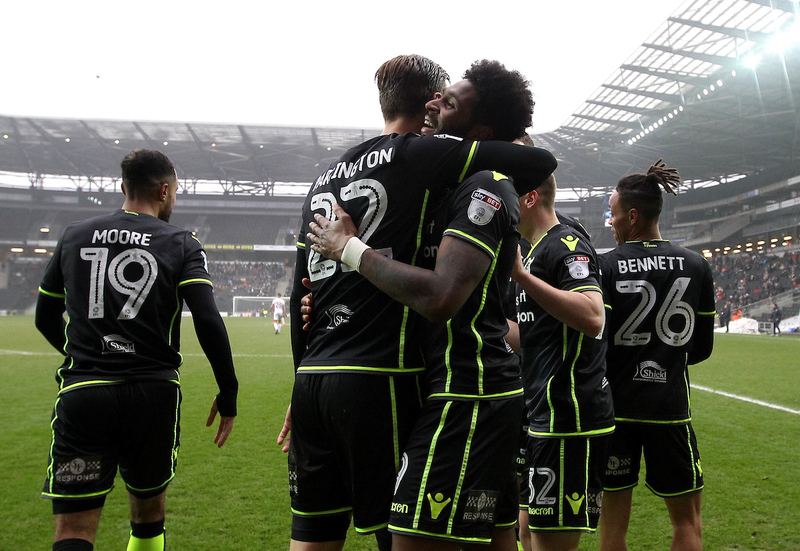 The striker found the net early on in the second half with a stunning finish, to ensure Rovers recorded the double over MK Dons. An even first half saw Rovers create the better on the handful of chances on offer. Kyle Bennett saw a goalbound shot deflected away as Liam Sercombe forced Lee Nicholls into making a fine save inside the opening forty-five minutes, as Rovers enjoyed the majority of possession. Just before the break, Nicholls produced another fine stop to again deny Sercombe, as the scores remained level heading into the break. It was Harrison’s eleventh league goal of the season just five minutes into the second half that proved to be the only goal of the game, as the striker curled home a delightful finish that caught out ‘keeper Lee Nicholls and secured victory for Rovers. Heading into the game, Rovers boss Darrell Clarke opted to make three changes to the side that faced Scunthorpe United last weekend. The noticeable change came in the shape of Luke Russe’s inclusion in the starting eleven, as the teenager made his EFL in the heart of the Rovers midfield. Further changes came in the form of Sam Slocombe returning to the starting eleven, as the goalkeeper made his first start between the posts since October’s Checkatrade Trophy encounter with West Ham, as Byron Moore also was named in the starting eleven. 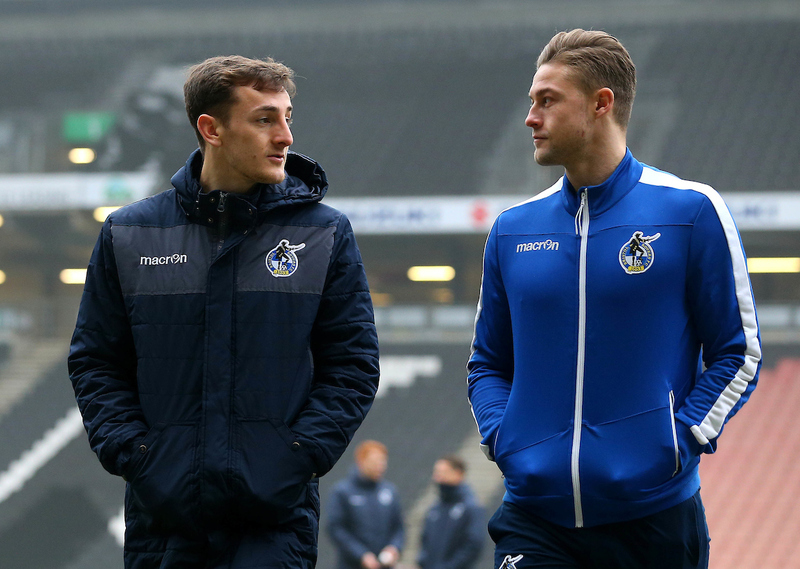 A welcome feature of the starting line-up for Rovers was the total number of academy graduates on show, with no fewer than four (Chris Lines, Tom Lockyer, Luke Russe and Ellis Harrison) representing Rovers in Buckinghamshire. The hosts started the encounter brightly and forced Rovers to be alert in the opening minutes. Chucks Aneke managed to forge his way into an advanced position down the left and diverted a cross into the Rovers penalty area that was aimed towards Robbie Muirhead. The cross was touched over the crossbar by the backtracking Rovers defence, who managed to beat Muirhead to the ball and from the resulting corner, Callum Brittain blasted a volley from the penalty spot well wide of the target. Rovers responded with phases of play deep inside the MK Dons half, working series of passes across the width of the penalty area before a Lee Brown cross fell just out the reaches of Ellis Harrison. Following the neat period of play, as longball over the top was taken down by Ellis Harrison, as the striker cushioned the ball to Liam Sercombe, who saw his powerfully struck attempt from outside the area blocked. As the game progressed to the twenty-minute mark, Robbie Muirhead launched a long-range attempt with his left-boot that had Slocombe concerned, as the goalkeeper dived to ensure the shot didn’t creep under the crossbar from twenty-five yards out. Darrell Clarke’s side created the best opportunity of the first half, as Chris Lines unpicked the MK Dons defence with a floated ball out wide to the meet the run of Lee Brown. The defender halted his run to remain onside and advance to the byline, before cutting the ball back to the unmarked Kyle Bennett. The forward took a touch to plot a path to gal through the congested area, but slightly off balance Bennett couldn’t put any purchase on his attempt. The chance was quickly succeeded by a powerfully struck shot from Liam Sercombe from inside the area that goalkeeper Lee Nicholls had to tip around the post in what was a fine save. The visitors started to show control in midfield and almost again forged a chance with an intricate move down the right that saw an interchange of passes between Byron Moore, Joe Partington and Luke Russe, but the move ended when Russe’s cross was deflected behind for a corner. In the closing stages of the first half, a penetrating header from Luke Russe set Ellis Harrison on a deep run into the final third. The striker advanced into the penalty area and looked to cut back his run, as a stray boot took the ball out of the clutches of Harrison who was poised to shoot. Moments later, the Sercombe again tried his luck from outside the box and was again denied by former Rovers ‘keeper Tom Nicholls, who managed to adjust his body to push the ball around the right-hand upright. Rovers continued the push number forward in the early stages of the second half, as Kyle Bennett’s fiercely struck shot from the fringe of the MK Dons area was blocked. 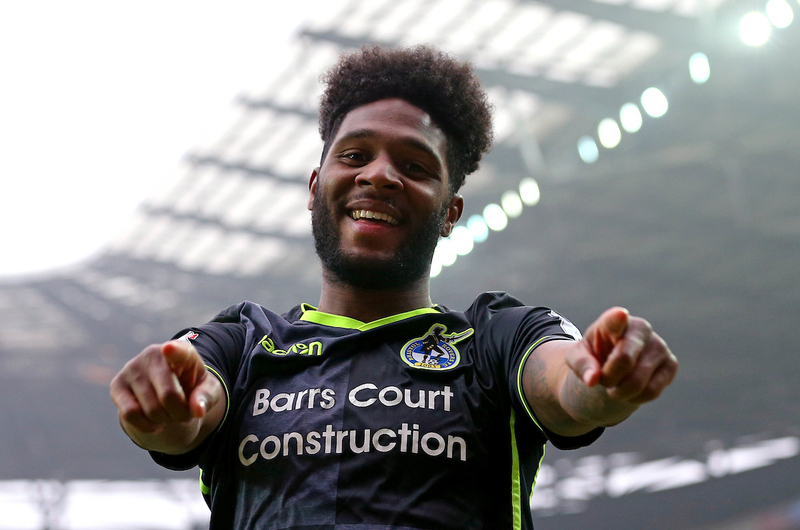 After a spell of dominance in the game, Rovers finally got the goal they deserved as Ellis Harrison grabbed his second goal in as many games. The move was started by Chris Lines, who set Ellis on a run down the left. The striker edged closer to the MK Dons area and took everyone by surprise, launching a bending finish that nestled into the top corner. Immediately after scoring, Rovers had to be alert to prevent MK Dons levelling the scores from a counterattack. Dean Lewington broke free down the left and took aim with a low cross into a threatening position, with the ball claimed by a Sam Slocombe, who darted off his line to take control of the situation. Rovers made a double substitution midway through the first-half, with the changes seeing James Clarke make a welcome return to first-team duties following his long absence through injury. From a set-piece, Rovers looked to add to their slender lead, as Lee Brown took control of directing a shot towards goal that was blocked by the defensive wall, as Brown couldn’t direct his rebound on target. Although seemingly in control of the game, Rovers did have goalkeeper Sam Slocombe to thank for keeping the scores level, as the shot-stopper produce a diving save to push wide a well-struck attempt from Robbie Muirhead. 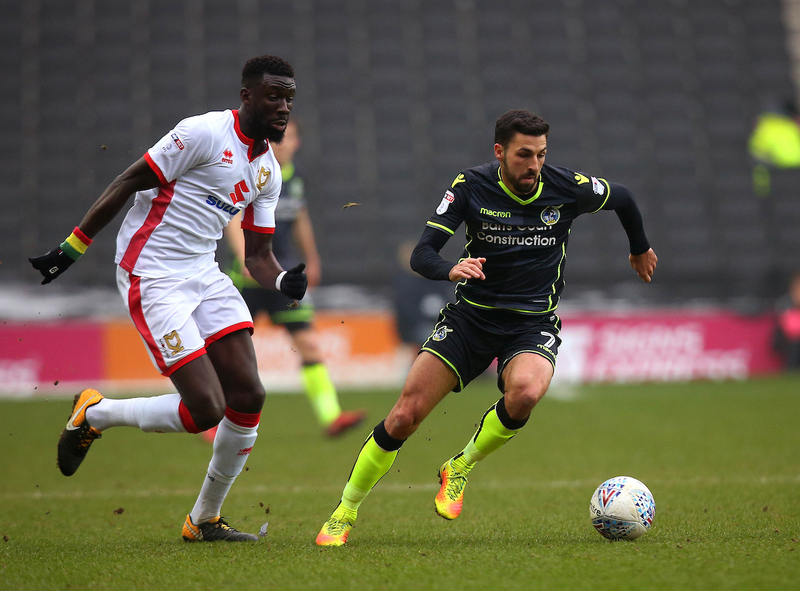 Rovers saw out the remainder of the game with little threat from MK Dons, adopting a change in formation to house five at the back to ensure the victory. Rovers XI: Sam Slocombe (GK), Joe Partington, Tom Lockyer (c), Tony Craig, Lee Brown, Chris Lines, Luke Russe, Liam Sercombe, Kyle Bennett (64′ Rory Gaffney), Byron Moore (64′ James Clarke), Ellis Harrison. Subs: Adam Smith (GK), James Clarke, Ryan Sweeney, Bernard Mensah, Dom Telford, Tom Nichols, Rory Gaffney. MK Dons: Lee Nicholls (GK), George Williams, Dean Lewington (c), Scott Wootton, Ousseynou Cisse (55′ Ed Upson), Chuks Aneke, Elliot Ward, Robbie Muirhead, Josh Tymon (76′ Kieran Agard), Callum Brittain (84′ Aidan Nesbitt), Ike Ugbo. Subs: Wieger Sietsma (GK), Ed Upson, Osman Sow, Kieran Agard, Conor McGrandles, Aidan Nesbitt, Oran Jackson.